I bought this game for 50p from the 'Poole Indoor Market' in 1982. It is certainly one of the best 50p's I have ever spent! I'm not sure of the manufacturing date of this game, since there is no mention of a date anywhere on the box or in the instructions. But I think around 1975 would be about right. Games like this are a rare breed. Hopefully as you look down through this page, you will see the care and detail that has gone into creating it. I love the painting on the cover of the box. It's really atmospheric, showing two POW's attempting to escape. I especially like the German soldier with his head turned in their direction. Has he heard something in the darkness?! I don't think this game is manufactured anymore (please let me know if you know otherwise) and as far as I can tell, it hasn't been manufactured for quite a long time. 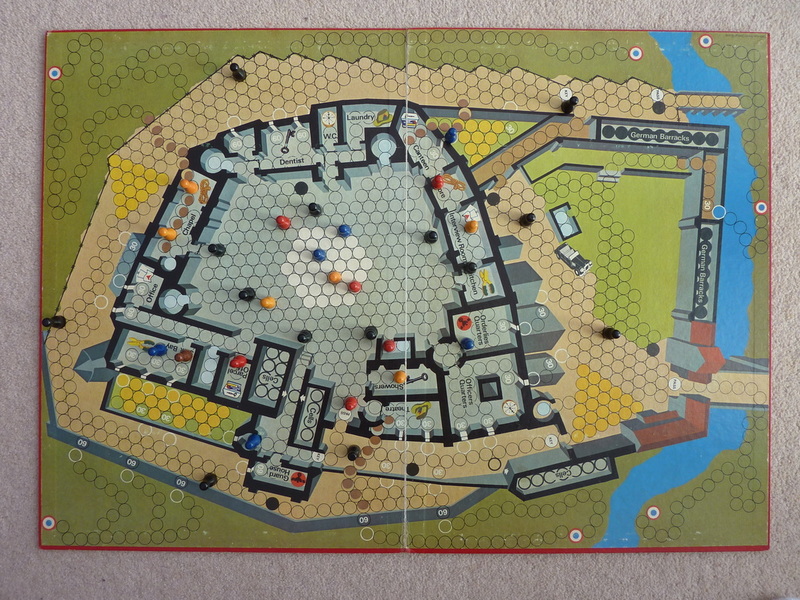 The Colditz game-board is probably my favourite of any board game ever. The use of hundreds of circles means that there is always a multi-varied way of moving about - but you are still bound by specific spaces. I just love the sheer size of this board too. It's really big. This size, coupled with the many spaces which are small lends the game an expansive feel..
Also, the game-board only has a single fold in the middle. I much prefer that design. - Most modern board games have their boards split three ways or have one open edge to allow it to fold up smaller (it's all to save money), but these designs make the board far less sturdy. It's size also gives the game scope. To actually succeed in an escape, you have to move out from the central white starting position, escape from the inner courtyard, make your way outside, then make your way through barbed wire or over walls and then finally try and reach home. It feels like a great achievement if you make it! The quality and content of the game box is fantastic. The image on the left shows the box interior, but not all the content! (Click for full size). I love the little touches like the extremely snug fit of the dice holders. I like the way the POW pieces fit neatly in, only by topping & tailing them. 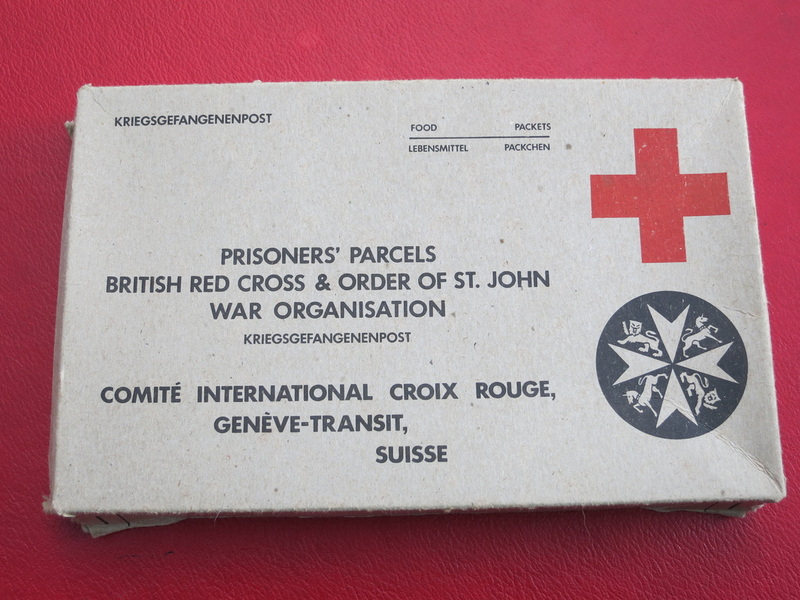 The inner box that contains the game cards is made up to look like a Red Cross parcel - a brilliant touch! This was made during a time when owning a board game was a great thing! Something that you looked after and treasured. It's a shame that many games nowadays are so cheap. They often cost just a few pounds and contain some coloured plastic pieces of rubbish and consequently they are viewed as almost a throwaway item. The image on the right shows the box that contains the various gaming cards. I can only imagine how great it must have been, receiving one of these packets in a POW camp. I also like the fact the possessive apostrophe is in the correct place on the word, 'prisoners'! This is just the sort of thing that would be incorrect today. - People have forgotten how to write properly! As mentioned, I do love the box contents, but it would have been even better if this game-card box contained an inner tray to keep all the cards separated. As it is, they just all sit in there together, causing them to become mixed up. 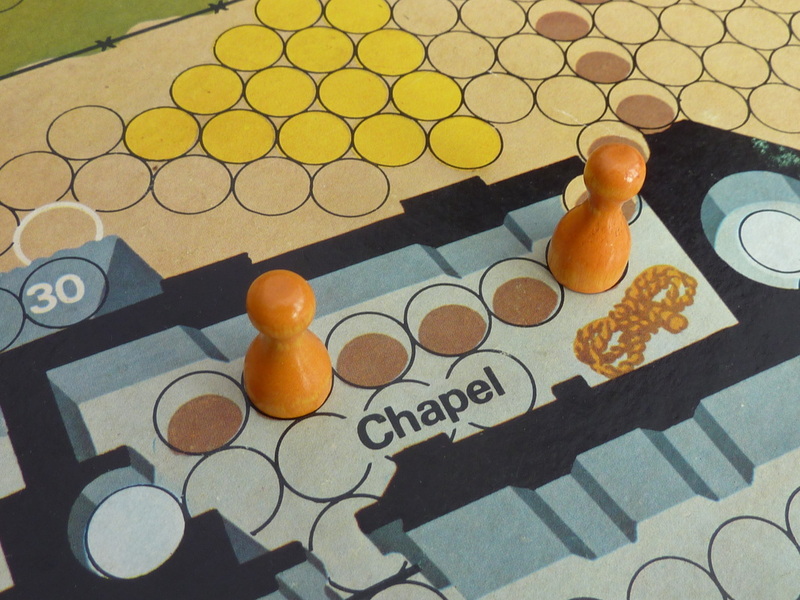 Escape From Colditz uses beautiful solid wooden pieces. Personally, I would like to ban plastic pieces from all board games! Each piece is colour coded to the nation of POW's that you opt to control. 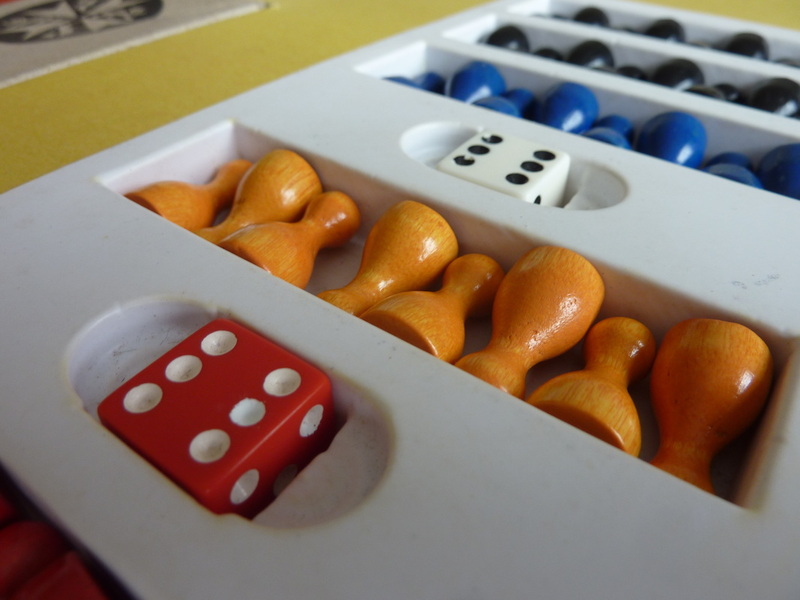 Each player can use up to eight pieces (which is dependent on how many people play the game). The image on the left shows a close up of the pieces and dice. Also in the box are three more additional items. 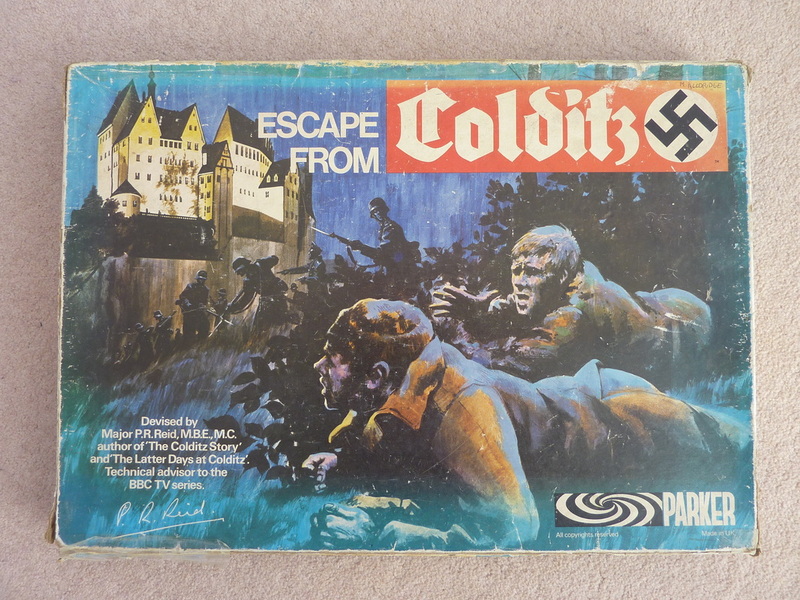 A delicious legend which gives the player information about the various items shown on the board, the game instructions, and also a booklet written by Major Pat Reid which tells you all about the real Colditz. It's excellent. You can see these below. 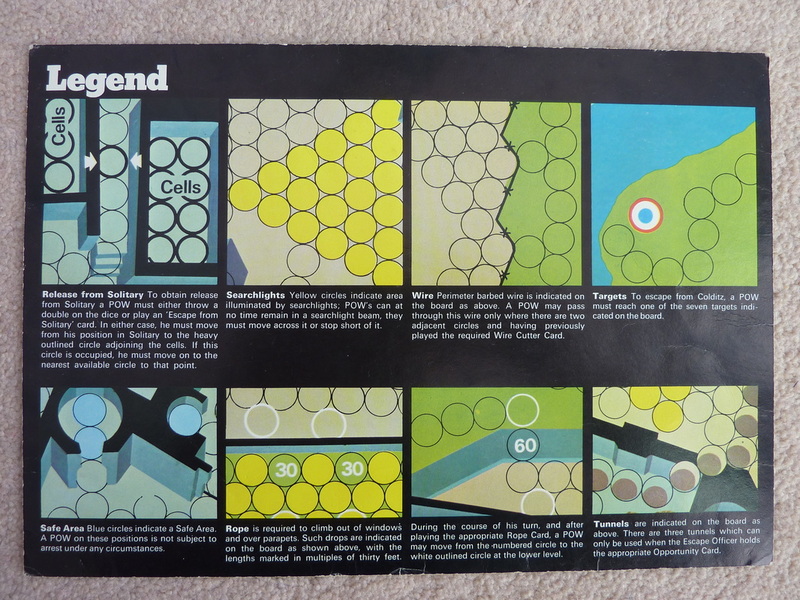 I have always loved the word 'Legend' when used on maps and other material. The same word is used in the arcade game, 'Gauntlet' too! This legend card explains some of the key areas of the board and how they work. I particularly like the simple, but effective 'searchlights' (coloured yellow). You can cross them completely on your turn, but you cannot remain in them. 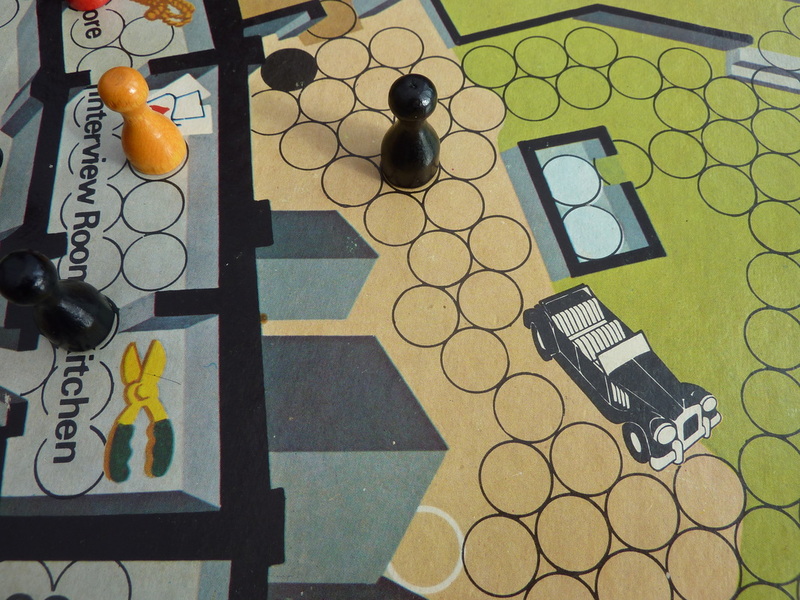 The partly coloured brown circles represent tunnels (which can only be used when a POW plays a specific tunnel card). Blue circles are 'safe areas' where a POW is completely safe and can take a breather (there aren't many of these). You can also see barbed wire and how that is represented. Wire cutters are required to get through these obstacles. 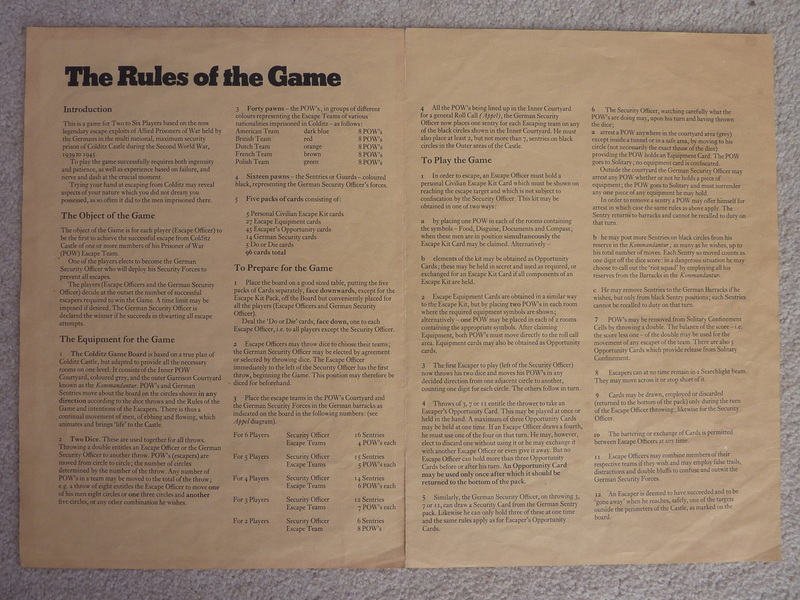 The game rules are provided on a two page single fold out A4 booklet (shown left). They are fairly standard although when I played this game a lot in the 80's, I discovered some 'gaps' in the rules. I say 'gaps', but I'm quite aware that most people would not have a problem with them. But unfortunately for me, I dislike ambiguity and so in the end, I wrote to 'Parker Games' to seek some clarifications. 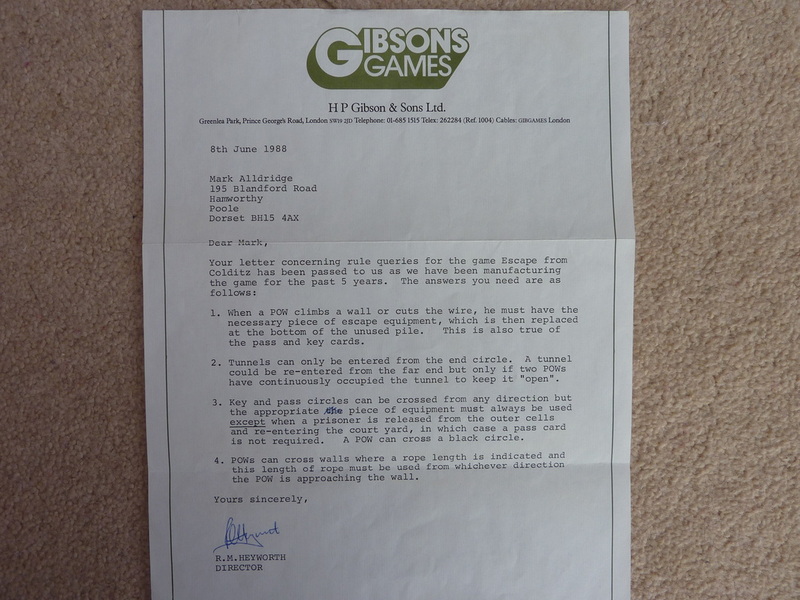 Parker passed the letter on to 'Gibson Games' who subsequently replied. Their response can be found further down this review. 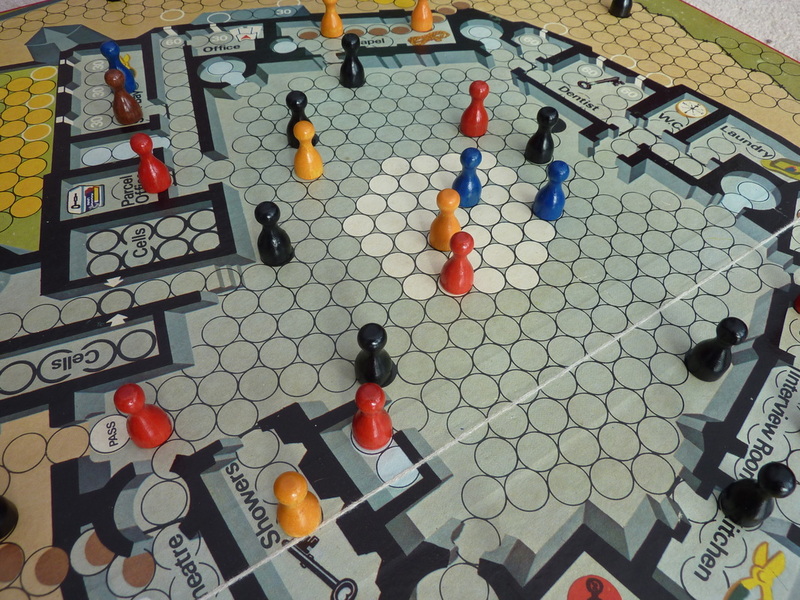 The game can be played by three to six people. Up to five players can play one of the escaping nations with one person always having to control the German army. It is that person's job to try and thwart any escape attempts. Playing the German guards is pretty tough, (especially if you play with five or more players) because at times, you can be stretched trying to cover all the various nefarious goings on! However, it can also be fun. It's always rather satisfying when you block an attempted escape or confiscate escape equipment. This design element does mean that you can't play the game with two players however. But I do think the game is better for it. 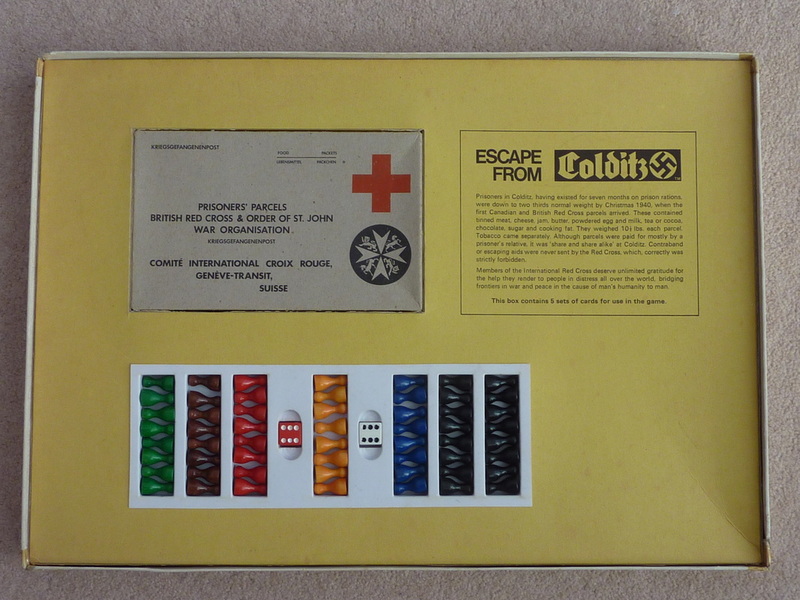 It's much more satisfying escaping from Colditz, knowing that you have beaten a real person - rather than just some convoluted game rules or random card selections. POW's and Germans rubbing shoulders! Two brave dutch POW's inside a tunnel! Another good aspect of this game, is the collusion that players who are playing one of the POW factions can achieve. The swapping and 'bartering' of equipment is allowed at any time and this injects social interaction into the game (and of course it is what actually happened for real during the war). The picture on the left shows the tunnel in the 'Chapel'. Two POW's must remain in a tunnel at all times to keep it 'open'. 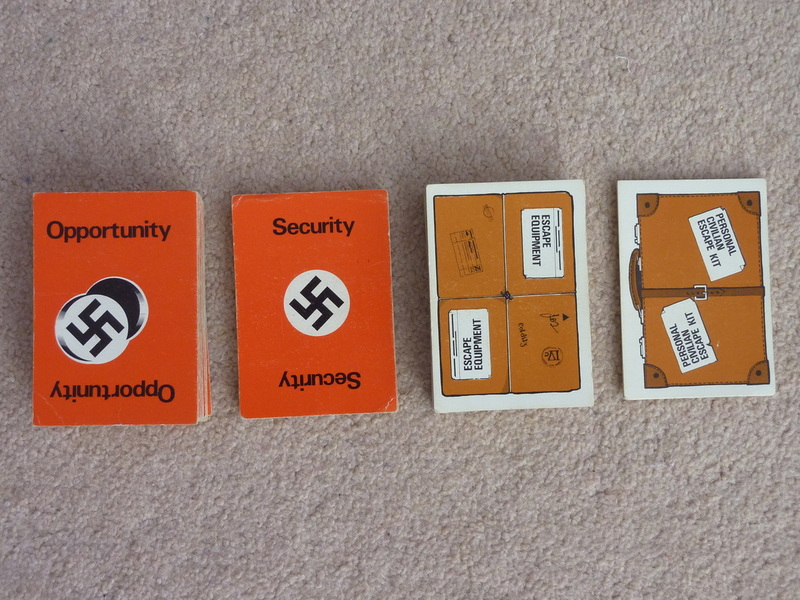 My set of 'Escape from Colditz' is missing one card. The German 'Search the Tunnel - Chapel' card. So this was a good tunnel to use by POW's! It's a shame this card was missing, but it was missing from the day I bought the game (it was second hand after all). It took many years before I could find out which card was missing though! The image on the right shows the 'Staff Car' - one of the more audacious escape attempts you can make in the game. If a POW has the right card and can make it to the car unscathed (which in itself requires other equipment), it is possible for him to jump in the car and drive right out the main gate! Bold as brass! If you read the booklet that comes with the game, Pat Reid talks about real escape attempts like these that were conducted during the war. Some of the stunts that the real-life POW's pulled off in Colditz, really are quite incredible. These are provided to the POW's whenever they roll a three, seven or eleven on the two dice and they provide them with some kind of help or opportunity. An example of one is shown below right. These are essentially Opportunity cards for the German forces. Again, rolls of 3, 7 or 11 provide the German forces with one of these cards. Amongst other things, they allow him/her to quickly arrest a POW or to perform a 'roll call' where all POW's must move into the courtyard. All POW's need to obtain various pieces of equipment in order to escape. Items such as rope, wire cutters, false passes etc. They can be held in-hand and used at any time. POW's can also barter them amongst themselves. 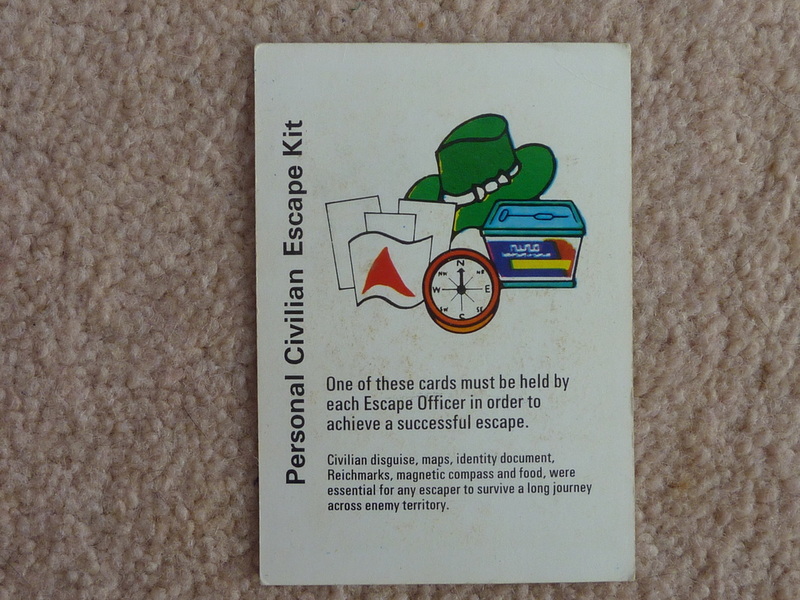 Before any POW can escape (whether or not they manage to get outside the castle), they must hold one of these cards. Designed to look like a travelling suitcase, obtaining one of these is the major goal for POW's when the game begins. 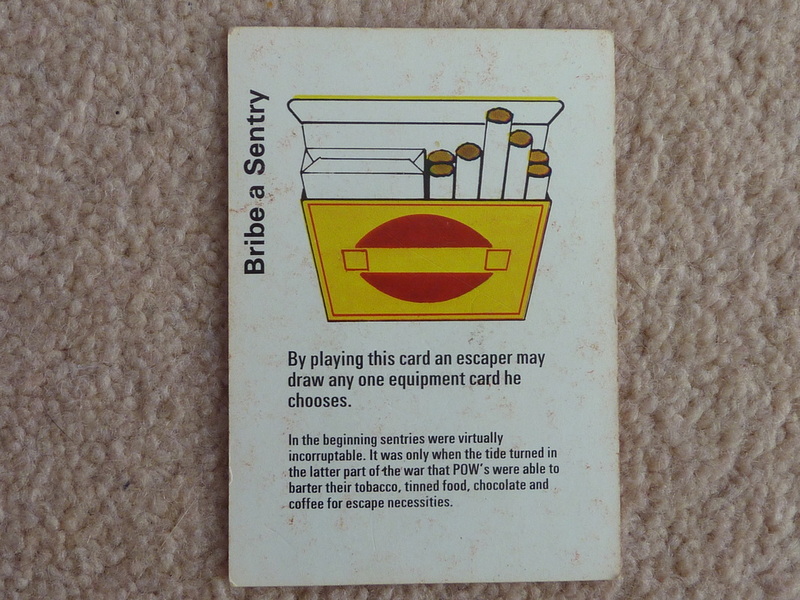 A nice little touch with all of these game cards, is that each one contains a snippet of information pertaining to how that item actually worked in Colditz during the war. As mentioned earlier, I once wrote to Parker Games back in 1988 to get some clarifications on some rule points that I thought were ambiguous. Gibson Games dutifully replied and their response is shown on the right (click for full size). Already it seems quaint, since the letter was typed and they made one mistake and simply scribbled it out! Well I hope you enjoyed my write up on this fantastic board game. If you see any errors or have any thoughts you'd like to share with me, do drop me a line, I would love to hear from you!